But, it seems, this was a regular thing, a populist gathering at which everyone dresses in RAF uniforms and 1940s clothing, including (among the ladies) seamed nylon stockings, and (among the men) double-breasted suits and badly knitted tank tops, of the like my mother used to make me wear. Yet, looking around the mildly raucous lounge bar, it occurred to me that my wife and I were the only ones present who were around in the 1940s. 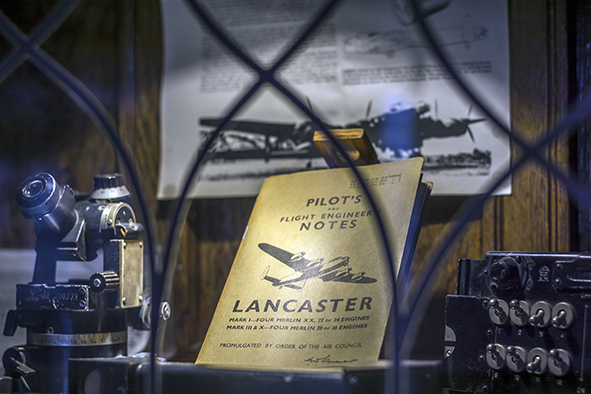 We soon discovered that the hotel served as a military hospital for injured soldiers during the Great War, but it is as the home of the legendary RAF 617 ‘Dambusters’ Squadron in World War Two that Petwood is best known. Occupied from 1942, it was originally home to officers of the 97 and 619 squadrons, but with nearby Woodhall Airfield chosen as the operational base, 619 squadron moved away and the officers of 617 moved in…hence the reunions, which once a year spill over into the village of Woodhall Spa, when everyone dresses up, including the hotel staff. The July Woodhall Spa 1940s Festival is proving very popular. 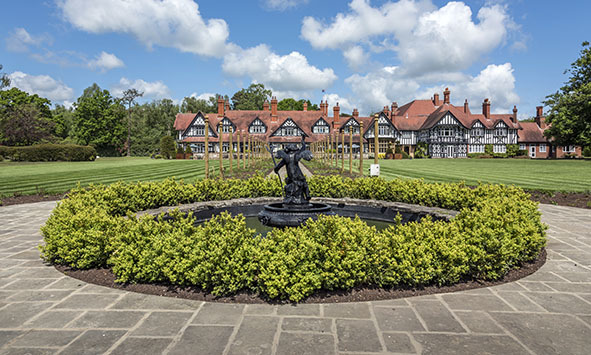 That the hotel should today play host to idiosyncratic gatherings such as that we encountered is, however, not unusual; Petwood has a long history of doing so. 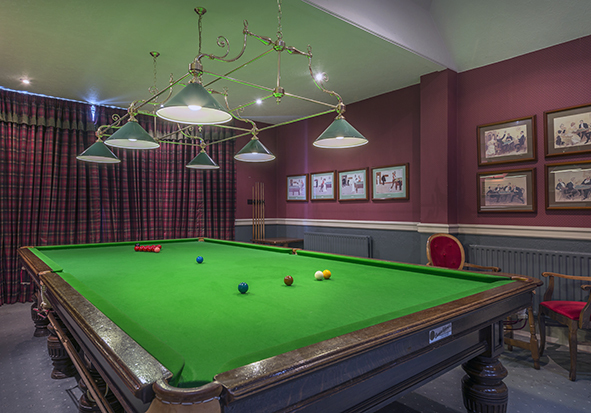 Famous guests have included King George VI, who not only visited but played tennis in the grounds; Prince Charles has stayed here, and the Queen of Spain. Other dignitaries and aristocrats make up an impressive list, from Stanley Bruce, the eighth Prime Minister of Australia, to Lady Mountbatten, and the Marquis of Douglas and Clydesdale, Air Commodore Douglas Douglas-Hamilton, 14th Duke of Hamilton and 11th Duke of Brandon, a Scottish nobleman and pioneering aviator famous for flying over Everest, who landed his aircraft in the grounds. 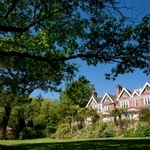 Set in thirty acres of grounds, the Petwood Hotel was the intended home of Baroness Grace van Eckhardstein, born Grace Maple, and served as her retreat during the unhappy last years of her first marriage. 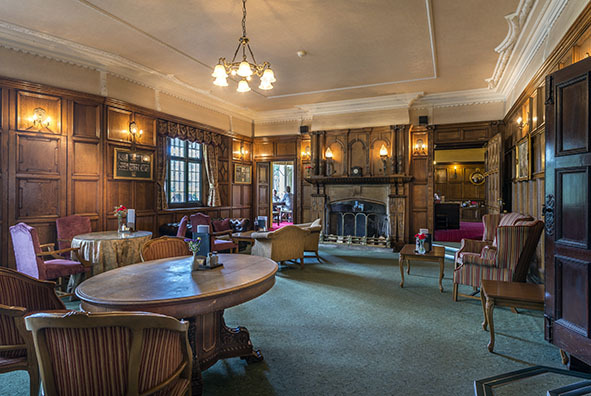 Dating from 1905, the hotel today is an extravagant and rambling display of neo-Tudor/Jacobean half-timbering, complete with splendid oak features including an exceptional hand-carved staircase, and a two-storey oriel window over the main entrance. 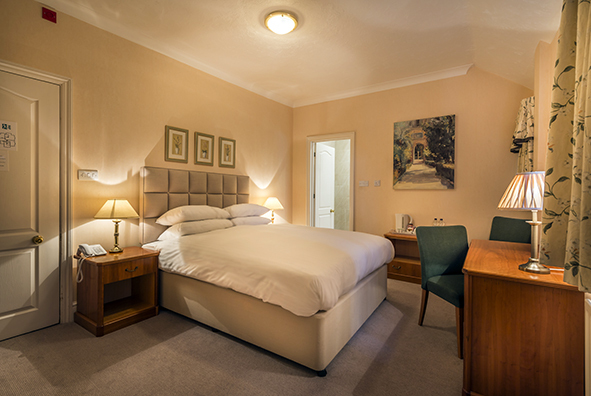 The hotel’s Edwardian antecedents are reflected in the bedrooms, in our case, the splendid four-poster Oak room, which overlooks the garden, and proved a hugely peaceful and well-sized retreat in which to unwind from a day trekking up and down Steep Hill in Lincoln. The need to retain this period feel is accentuated by concealing the television in a wood-panelled cupboard; out of sight, out of mind. The bathroom, complete with a generous array of Penhaligon toiletries, was modern, compact and warm; other bathrooms still feature large baths and the copper plumbing of past times. 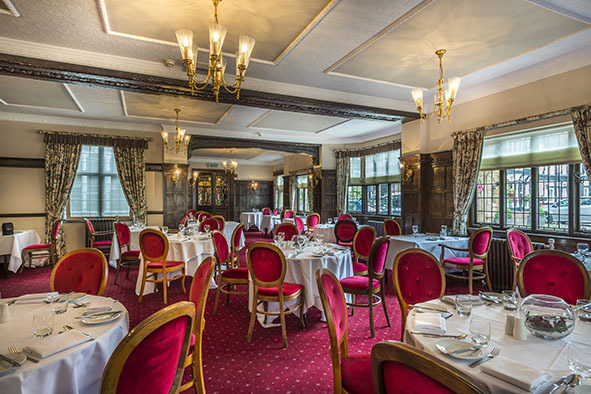 Our thoughts to turn to dinner, and here Petwood is on to a winner despite the AA inspectors seemingly not being aware that here is a restaurant deserving of at least two of their coveted rosettes. Still, head chef Phillip Long turns out some cracking dishes, very sensibly priced at £30 for two courses and £35 for three. 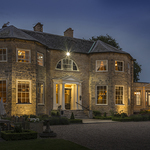 Nor is the menu overlong – 7 Starters, 11 Mains and 6 Desserts plus a splendid cheeseboard of Lincolnshire’s finest – and that serves to ensure quality control and enough dishes to satisfy anyone staying for a week, without having to repeat meals, or take their money elsewhere. One very minor quibble: the suggestion is that all produce is sourced locally, as it should be. But that’s not strictly true, as the mussels in cider that I had – delicious by the way – are from the Menai Strait in North Wales: I know because I asked, and, as it happens, I also know the man who produces them. But that aside, the dinner menu was everything it should be: comprehensive, imaginative and with such unusual delights as deep fried duck egg, smoked partridge and pear, calf’s liver and freshwater bream fillets. My wife opted for a chicken, pistachio and apricot terrine, a picture of yumminess it was a shame to disturb, and tasting as good as it looked. But it didn’t stop her filching one of my mussels, which she profoundly confirmed was from Anglesey – she used to work for the producer. Now my wife is a sucker for belly pork, in this case, roasted marinated belly pork with sage Dauphinoise and apple. When it arrived, she did the French thing of leaning over it and breathing in the aroma: at which point her eyes glazed over and she fell silent. I chose rump of lamb roasted with black cabbage and rosemary crushed potatoes – it’s been a long time since I had lamb that good, and then it was in a Michelin-starred restaurant. But I was torn; was it the lamb, or the slow roast short rib of beef with horseradish mash and rainbow carrots? I’m not a vegetarian, but I’m guessing that vegetarians would be pleased with the thought behind the choices at Petwood, from heritage tomatoes with a basil cheesecake, basil oil and reduced balsamic to grilled Chinese spiced tofu with edamame beans, chilli and green tea noodles, or poached gnocchi with roasted pumpkin and spinach in a cream sauce. The village of Woodhall Spa, which is where you’ll find the Petwood Hotel, is just 18 miles from the celebrated town of Boston, and the same from the ancient cathedral city of Lincoln making this an admirable place for a short break, a tale of two cities, in fact – well, it would be if Boston was a city. But, boasting the largest parish church in England, it’s no less an intriguing place to visit. 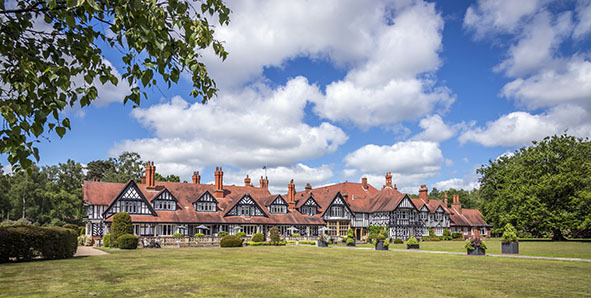 It was a brief stay at Petwood, but a memorable one that will be repeated before too long. I do like the tranquillity that enclosure within its own grounds brings; that and the freedom to wander away from the hoi polloi, among which I am numbered when out in the real world. Petwood Hotel, Stixwould Road, Woodhall Spa, Lincolnshire LN10 6QG. 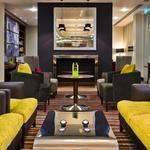 The hotel is dog-friendly, and dogs are welcome to stay in some rooms for £20 per room per night. There is ample on-site parking. Free Wi-Fi throughout the hotel.